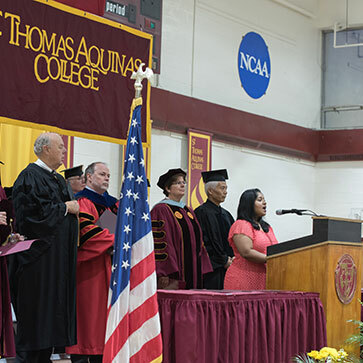 St. Thomas Aquinas College will host its annual Honors Convocation on Thursday, April 4, 2019, inducting students into various honor societies as well as recognizing those named to the Dean’s List. Frank G. Persico, former Vice President for University Relations and Chief of Staff at The Catholic University of America will give the Convocation address and receive an honorary Doctor of Humane Letters degree. Sr. Mary Murray, O.P., president, Dominican Sisters of Sparkill and former chancellor, Diocese of Great Falls-Billings, will receive the honorary Doctor of Public Service degree. Each honor society is committed to academic excellence in their respective areas. Societies inducting students at the Convocation include: Alpha Chi for general studies; Alpha Mu Alpha for students involved with the American Marketing Association; Alpha Phi Sigma for criminal justice; Chi Alpha Sigma for student-athletes; Delta Mu Delta for business administration; Kappa Delta Pi for teacher education; Kappa Mu Epsilon for mathematics; Phi Sigma Iota for foreign languages; Pi Gamma Mu for social science; Psi Chi for psychology; Sigma Tau Delta for English; and, Sigma Zeta for students majoring in natural, forensic and computer sciences and mathematics. Close to 100 students will be recognized for being on the Dean’s List in each of the last three semesters. Kathleen Beglin (West Nyack, NY), Dr. Neerja Chaturvedi (Piermont, NY), Janet Huyck (Pearl River, NY), Eileen Mastrovito, RN (Pearl River, NY), Baljit Patter (Mahwah, NY), Dr. Robert Trawick (New City, NY), and Siyong Yu (Rutherford, NY) will each receive the Laetare Medal, which commemorates 20 years of full-time service to the College. Additionally, the following student awards will be presented at the Convocation: the Betty LaSala Award to Andrea Solimando, recognizing excellence in science; the Environmental Writing Award to Katie Anne Bertussi in Honor of Rachel Carson; and the Jon Roberts Award to Aliza C. Deen for excellence in literary studies.